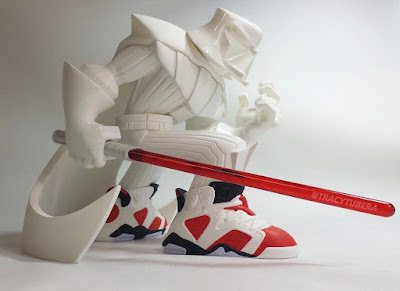 Tracy Tubera has announced he will be releasing the third colorway of his epic Darth Vader Jordan Sith Infrareds resin figure this weekend exclusively at Designer Con 2017! As Tubera explains, “the opposite of the Dark Side is the Light, and this Jordan Sith Infrared colorway has seen the light.” Featuring a glossy white helmet and gloves with a matte white body and cape, The Light Side Jordan Sith Infrareds comes rocking Carmine Air Jordan 6 sneakers. Limited to just 25 pieces, the Designer Con 2017 Exclusive The Light Side Darth Vader Jordan Sith Infrareds Star Wars Resin Figure was produced by Mana studios and measures 7” tall by 8” long. This beautiful hand crafted and painted figure can be purchased at Tracy’s DCon booth #320.